What the what? Yes, that's a mock subway car in the parking lot of the Metro Customer Center at Wilshire & La Brea, celebrating the announcement Tuesday afternoon that utility relocation is beginning for the Westside Subway Extension, a key Measure R-funded project. •Los Angeles Mayor Antonio Villaraigosa said the subway project is one of many that will help remake L.A. into a more transit-oriented city with more development around transit stations. “This town is crying out for these kind of investments,” he said. •As for the subway project, the current estimated timeline has the contract for construction awarded in 2014, the start of tunneling in 2015 and the opening of the first segment from Wilshire/Western to Wilshire/La Cienega in 2022/3. •Mayor Villaraigosa said that despite Measure J losing at the polls last week, he and Metro will work on a “plan B” to accelerate transit projects, including the subway. •Echoing that theme, Move LA's Denny Zane said that Measure J will now become the “poster child” for eliminating the super-majority needed for local sales tax votes, calling it a “perversion” that the measure could get nearly 65 percent of the vote and still lose. •Perhaps the most eyebrow-raising speaker of the day was Beverly Hills Mayor Willie Brien, who lauded the subway as a necessary project that will help mobility in the region. Brien did not address the lawsuits filed by the city of Beverly Hills and the Beverly Hills Unified School District against Metro over the subway's environmental studies and news media on hand declined to ask Brien or any public officials any questions. The news release is after the jump and shown below is the first official hole in the ground for utility relocation. Marking the first construction milestone for the long-awaited Westside Subway Extension project, the Los Angeles County Metropolitan Transportation Authority (Metro) today officially began utility relocation work in L.A.’s Mid-Wilshire District. 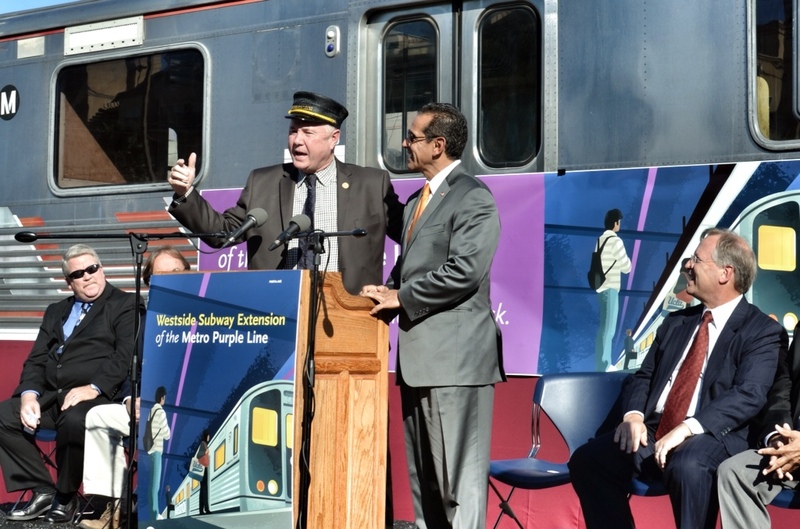 The work is a required precursor to future subway construction that will ultimately extend the Metro Purple Line by nine miles to key destinations on the Westside. 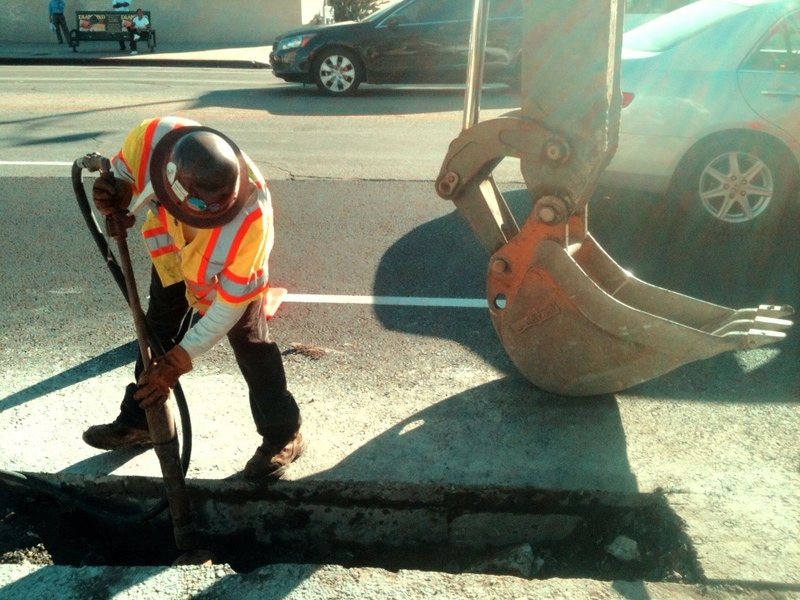 Utility crews have begun relocating existing underground telecommunication lines on Wilshire Boulevard between La Brea Avenue and Detroit Street where a future subway station is planned. Utility relocation work is also planned at Wilshire/Western and the future Wilshire/Fairfax and Wilshire/La Cienega stations over the next year and a half. Communities closest to these locations will be notified in advance of planned work activities. Together, the three stations constitute the project’s first four-mile construction phase. Utility relocation work is part of Metro’s overall preconstruction activities that will also include securing a construction contractor, acquiring needed real estate, continuing field testing and conducting ongoing community outreach. In the area around the La Brea Tar Pits, where there are higher levels of tar sands which may contain fossils and other paleontological resources, workers will also build an exploratory shaft to better evaluate ground conditions. Findings will be used for the final design of the Wilshire/Fairfax Station. In other project developments, the Federal Transit Administration recently permitted the project to advance into its Final Design phase. Metro intends pursue federal New Starts matching funds for the project next year. The total project is forecast to cost $6.3 billion based on a three-phase construction schedule. 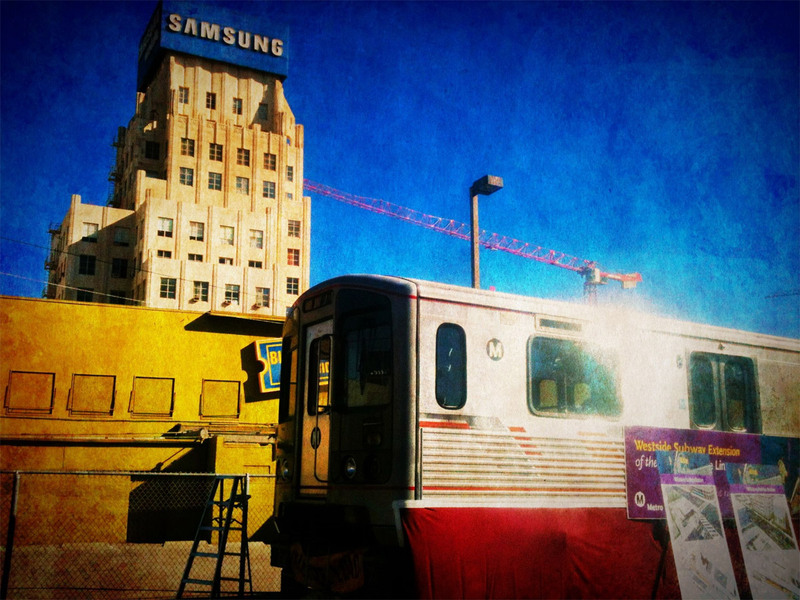 Major construction of subway stations and tunnels for the first segment between Wilshire/Western and Wilshire/La Cienega is expected to begin in 2014, with planned completion in 2023. The second construction phase would add another 2.6 miles of subway service and would include new Wilshire/Rodeo and Century City Stations, and has a planned opening date for 2026. The last remaining construction phase of the project would add another 2.9 miles to the service, include two new stations at Westwood/UCLA and Westwood/VA Hospital, and open in 2036. Once complete, the Purple Line Extension will include a total of seven new subway stations. About 49,300 people are forecasted to board the line at these stations. There would be about 78,000 new daily trips on the full Metro Rail System as a result of the opening of this line. Transit riders will be able to travel between downtown Los Angeles and the Westwood/UCLA Station in about 25 minutes. The Los Angeles Economic Development Corporation forecasts that the project will create 52,500 jobs (direct, indirect and induced), $3.04 billion in labor income, and $8.13 billion in business revenue generated by the project in theSouthern California region. For more information about the Westside Subway Extension project, visit metro.net/westside. cool pic! is that a replica of the subway? Yes, it’s a mock subway car that is often used for filming purposes and promotions. Wish they used it more often to get people excited about the project. Why will 2.9 miles come 10 years later if the other two phases are only 3 years apart from completion, and similar in length? 3/10 of a mile cant add 7 years. Please explain. The original estimated date for getting to Fairfax in Metro’s long-range plan was 2019. That was pushed back to 2022/3 when first phase was extended to La Cienega. I’ll be sitting down with the subway team soon to learn more about the construction timeline. Is that purple line train car still on display behind the blockbuster? I believe it has been taken away by now but not sure. This is great news! My concern is the anticipated opening date for the first phase. I recognize the magnitude of the project, however, I can’t avoid mentioning that the United States won World War II in 3.5 years and the scale of that project is of no comparison to tunneling from Western Ave to just the Miracle Mile Area. If our traffic congestion is so bad and LA’s lack of a 21st century transit system so desparately needed, why can’t more resources be poured into this vital link? I’m so excited for this, but the timeline is just beyond awful. 7 or 8 years? Those people who voted against measure J should be absolutely ashamed of themselves – a bunch of self-centered jerks. This project was covered under Measure R so Measure J had nothing to do with this. Measure J was for covering useless freeway projects and very little were to go to mass transit projects. Steven P is incorrect. Measure J proposed to accelerate the subway project so that all three segments were built at once, with completion to Westwood in roughly a decade instead of the current date of 2036. Also, Measure J proposed to accelerate half the Measure R transit projects. I’ll bet if that was specifically stated in the ads, and it were not sold as a simple job creator, it would have probably gained more momentum to outweigh the “no” votes. It could have also gained more “no” votes from people living outside of the area due to “unfairness”. Either way, Metro and us, the riders are still in the same boat with this 2036 completion date. As important as this project and many of the others are, at times I feel metro misses good opportunities. It does not happen all the time, but when they do they seem collosal. Like missing this vote, and the fact that this project has been delayed. It shows a lot about L.A. county and how it operates. When will Metro start differentiating between the Red Line and the Purple Line? The Purple Line stations are VERY outdated (still have red pylons and red dots on the station platform). Also, a seperate schedules for the Red Line and the Purple line should be here by now! It is annoying, however, that less than two months after Wilshire was FINALLY repaved, it is being dug up again.